Visitors looking to upgrade their plant’s slitting equipment will be interested in Calemard’s new fully automated solution to produce cap strips from a web of 1,600mm-width calendered textile. 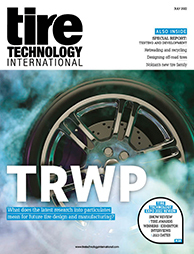 The machinery division of Spoolex will present this new technology at the 2019 Tire Technology Expo, alongside its existing equipment. Calemard designs and produces custom machines in-house. This includes standalone slitter-rewinder or spooling lines, as well as complete automated in-line cells. As an expert in slitting and tension control, it can supply machinery for plants making passenger, light truck, motorcycle and high-speed tires.